It might have been the sound of our students' voices raised in the chorus of The Sound of Music or the peeling of bells in the cupola at just the right moment in the play. It might have been the crisp touch of fall in the air or the sunlight falling through the shaded oaks of St. Charles Ave. It might have been our cross country team powering though a muddy track to bring home our 11th state championship or our volleyball and swimming teams driving and diving for a victory. It might have been the festive closing of the Bicentenary year with the Archbishop or our enactment of the story of St. Rose Philippine Duchesne. Suddenly, I am praying a psalm of thanksgiving and gratitude. The spirit of Thanksgiving breaks through in our lives in many unexpected and enigmatic ways - some spectacular, some more subtle. At times, we wait for this Spirit which can remain veiled by mindlessness, suffering, and pain. Our thanksgiving is not complete when the anguish of our humanity is so raw and real. This Thanksgiving, I am certain that our hearts are one with those who have lost their homes to devastating wildfires, one with those who are battling cancer, one with those who have lost loved ones, and one with those who grieve after the senseless loss of precious human life through violence. Our thanksgiving is not complete. Fr. Thomas Merton observed, "To be grateful is to recognize the love of God in everything He has given us - and He has given us everything. Every breath we draw is a gift of His love, every moment of existence is a grace, for it brings with it immense graces from Him." This is my prayer for each of you this Thanksgiving: that you draw from every breath God's gift of presence, and from every moment the gift of grace waiting there just for you. 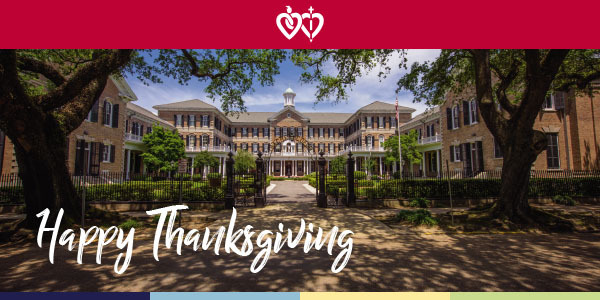 For the many surprising blessings of ministry in this special community of Christ's heart in New Orleans, I am so grateful. May we each continue to build up the kingdom of God right here "at home on the Avenue" with the daily gifts of forgiveness, kindness, gentleness, and peace that are so needed in our world. Sr. Melanie A. Guste, RSCJ, Ph.D.